宋泰, 黄艇, 张晨捷, 彭士明, 高权新, 施兆鸿. 养殖水体中二种溶解态铜对凡纳滨对虾生长和免疫功能的影响[J]. 上海海洋大学学报, 2019, 28(1): 75-83. SONG Tai, HUANG Ting, ZHANG Chenjie, PENG Shiming, GAO Quanxin, SHI Zhaohong. 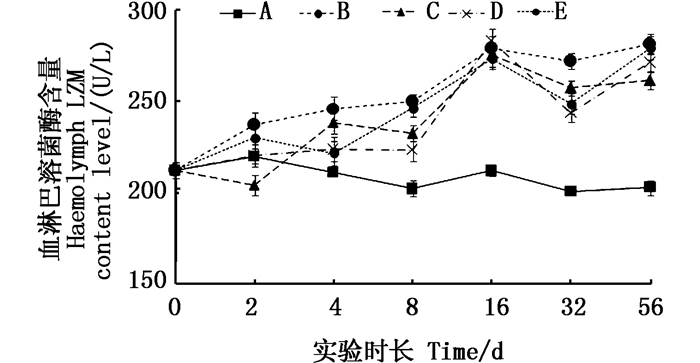 Effects of two kinds of dissolved copper on growth and immune function of Litopenaeus vannamei[J]. Journal of Shanghai Ocean University, 2019, 28(1): 75-83. ALBERGONI V, PICCINNI E. Biological response to trace metals and their biochemical effects[M]//LEPPARD G G. Trace element speciation in surface waters and its ecological implications: NATO Conference Series (Ⅰ Ecology), vol 6.Boston, MA: Springer US, 1983: 159-175. TOMASZEWSKA E, MUSZYHSKI S, OGNIK K, et al. Comparison of the effect of dietary copper nanoparticles with copper (Ⅱ) salt on bone geometric and structural parameters as well as material characteristics in a rat model[J]. Journal of Trace Elements in Medicine and Biology, 2017, 42(42): 103-110. 许星鸿, 唐瑶, 杜丹丹, 等. 水环境污染胁迫对甲壳类免疫生理生化影响的研究进展[J]. 安徽农业科学, 2013, 41(34): 13275-13276. XU X H, TANG Y, DU D D, et al. Research progress on the effects of water environment pollution stress on the physiological and biochemical effects of crustaceans[J]. 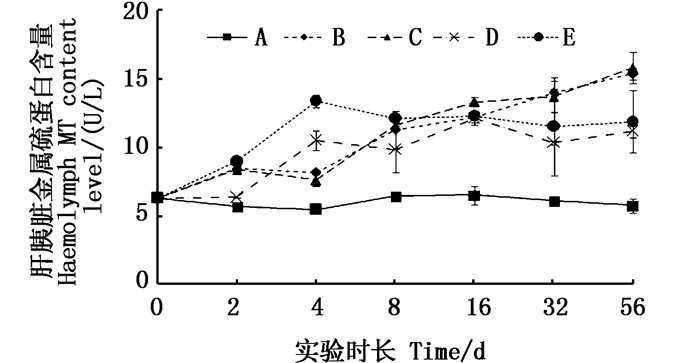 Journal of Anhui Agri.Sci, 2013, 41(34): 13275-13276. 聂政伟, 王磊, 刘永利, 等. 铜合金网衣在海水养殖中的应用研究进展[J]. 海洋渔业, 2016, 38(3): 329-336. NIE Z W, WANG L, LIU Y L, et al. Development and application of fishery copper alloy netting[J]. Marine Fishery, 2016, 38(3): 329-336. HE T, ZHU W, WANG X, et al. Polydopamine assisted immobilisation of copper(Ⅱ) on titanium for antibacterial applications[J]. Materials Technology, 2015, 30(B2): B68-B72. LEAL M, VAN DEN BERG C. Evidence for strong copper(Ⅰ) complexation by organic ligands in seawater[J]. Aquatic Geochemistry, 1998, 4(1): 49-75. 高春生, 王春秀, 范光丽, 等. 水体铜对黄河鲤非特异性免疫功能的影响[J]. 安全与环境学报, 2008, 8(4): 1-4. GAO C S, WANG C X, FAN G L, et al. The effect of copper on non-specific immunity of Cyprinus carpio[J]. Journal of Safety and Environment, 2008, 8(4): 1-4. 董晓慧, 杨原志, 郑石轩, 等. 饲料中不同铜源和水平对凡纳滨对虾生长、免疫和组织铜含量的影响[J]. 大连水产学院学报, 2007, 22(5): 377-383. DONG X H, YANG Y Z, ZHENG S X, et al. Effects of dietary copper sources and levels on growth, immunity and Cu concentration in tissues of white legshrimp Litopenaeus vannamei[J]. Journal of Dalian Fisheries University, 2007, 22(5): 377-383. 李登新. 环境工程导论[M]. 北京: 中国环境出版社, 2015: 279. LI D X. Introduction to environmental engineering[M]. Beijing: China Environmental Science Press, 2015: 279. NY5052-2001 Harmless food and aquaculture water standard[S]. The ministry of agriculture of the People's Republic of China, 2005. 刘存岐, 王安利, 王维娜, 等. 海水中几种金属离子对中国对虾幼体体内碱性磷酸酶和ATPase的影响[J]. 水产学报, 2001, 25(4): 298-303. LIU C Q, WANG A L, WANG W N, et al. Influences of metal ions in seawater on activities of alkaline phosphatase(AKP) and ATPase in mysis and postlarvae of Penaeus chinensis[J]. Journal of Fisheries of China, 2001, 25(4): 298-303. HANSEN D J, BERRY W J, MAHONY J D, et al. Predicting the toxicity of metal-contaminated field sediments using interstitial concentration of metals and acid-volatile sulfide normalizations[J]. Environmental Toxicology And Chemistry, 1996, 15(12): 2080-2094. XU F Z. Fabrication of organic compound membrane on copper and research on corrosion properties in seawater[D]. Ocean University of China, 2012. 赵楠, 罗兵辉, 柏振海. 铜合金在海水中的腐蚀行为研究[J]. 材料保护, 2003, 36(3): 21-23. 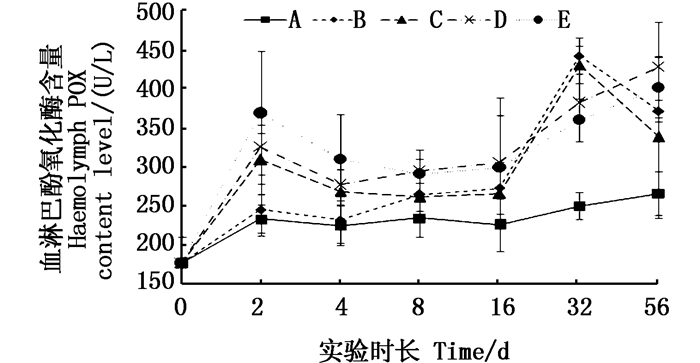 ZHAO N, LUO B H, BO Z H. Corrosion behavior of copper alloy in seawater[J]. Materials Protection, 2003, 36(3): 21-23. Standard test method for determination of copper release rate from antifouling coatings in substitute ocean water[S]. ASTM, Standards Press of US, 2005. 宋维彦, 王秀敏, 靳桂双. 铁铜锌对凡纳滨对虾生长和非特异免疫的影响[J]. 江苏农业科学, 2011, 39(6): 376-379. SONG W Y, WANG X M, JIN G S. Effects of iron and copper zinc on growth and non-specific immunity of Litopenaeus vannamei[J]. Jiangsu Agricultural Sciences, 2011, 39(6): 376-379. 周萌, 王安利, 曹俊明. 饲料中不同形式的铜及添加量对凡纳滨对虾(Paneaus vannamei)生长性能、血清铜蓝蛋白和生长激素水平的影响[J]. 海洋与湖沼, 2010, 41(4): 577-582. 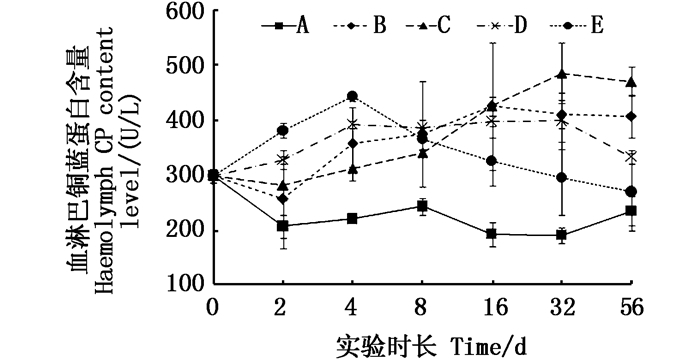 ZHOU M, WANG A L, CAO J M. Effects of different forms of copper and supplement on growth performance, serum ceruloplasmin, and growth hormone level of Paneaus vannamei[J]. Oceanologia Et Limnologia Sinica, 2010, 41(4): 577-582. 王维娜, 王安利, 孙儒泳. 水环境中的铜锌铁钴离子对日本沼虾消化酶和碱性磷酸酶的影响[J]. 动物学报, 2001, 47(s1): 72-77. WANG W N, WANG A L, SUN R Y. Effects of Cu2+, Zn2+, Fe3+ and Co2+ in freshwater on digestive enzyme and alkaline phosphatase activity of Macrobrachium nipponense[J]. Acta Zoologica Sinica, 2001, 47(s1): 72-77. DECKER H, JAENICKE E. Recent findings on phenoloxidase activity and antimicrobial activity of hemocyanins[J]. Developmental & Comparative Immunology, 2004, 28(7): 673-687. BO C, YING L, HONG Y Y, et al. Effect of copper on the growth of shrimps Litopenaeus vannamei:water parameters and copper budget in a recirculating system[J]. Chinese Journal of Oceanology and Limnology, 2014, 32(5): 1092-1104. LI N, ZHAO Y L, YANG J. Accumulation, distribution, and toxicology of copper sulfate in juvenile giant freshwater prawns, Macrobrachium rosenbergii[J]. Bulletin Of Environmental Contamination And Toxicology, 2005, 75(3): 497-504. 汪多, 田相利, 董双林, 等. 不同饲料添加物对凡纳滨对虾生长和血清非特异免疫指标影响的研究[J]. 海洋湖沼通报, 2017, 39(3): 106-114. WANG D, TIAN X L, DONG S L, et al. 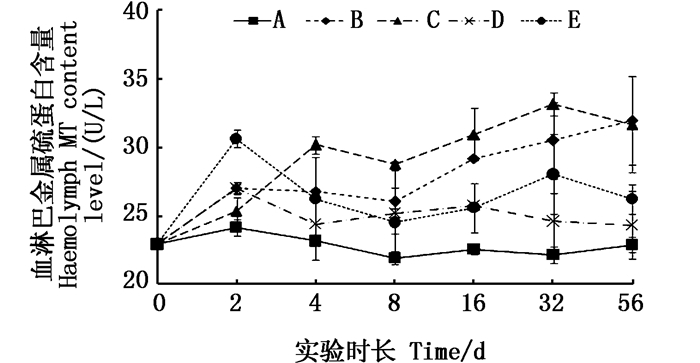 Effects of several additives on the growth and non-specific immunity in serum of Litopenaeus vannamei[J]. Transaction of Oceanology and Limnology, 2017, 39(3): 106-114. DAVIS S R, Cousins R J. Metallothionein expression in animals:A physiological perspective on function[J]. Journal of Nutrition, 2000, 130(5): 1085-1088. SYRING R A, BROUWER T H, BROUWER M. Cloning and sequencing of cDNAs encoding for a novel copper-specific metallothionein and two cadmium-inducible metallothioneins from the blue crab Callinectes sapidus[J]. Comparative Biochemistry And Physiology C-Pharmacology Toxicology & Endocrinology, 2000, 125(3): 325-332. 李诗逸, 孙继鹏, 易瑞灶, 等. 金属离子对水生动物体内金属硫蛋白应激诱导研究进展[J]. 水产科学, 2014, 33(9): 594-600. LI S Y, SUN J P, YI R Z, et al. Research progress on metal ion stress and induction to metallothionein in aquatic animals[J]. Fisheries Science, 2014, 33(9): 594-600. 李湘萍, 程波, 程江峰, 等. 铜离子在养殖对虾组织中的积累及其对金属硫蛋白含量的影响[J]. 青岛科技大学学报(自然科学版), 2011, 32(5): 492-496. LI X P, CHENG B, CHENG J F, et al. Copper ion accumulation in Litopenaeus vannamei and the effect on metallothionein in different aquaculture systems[J]. 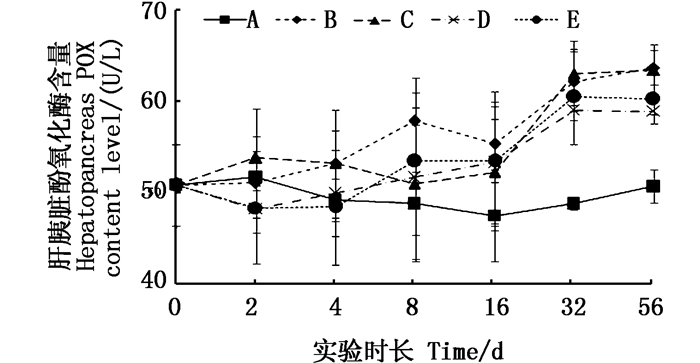 Journal of Qingdao University of Science and Technology:Natural Science Edition, 2011, 32(5): 492-496. BURMESTER T. Evolutionary history and diversity of arthropod hemocyanins[J]. Micron, 2004, 35(1/2): 121-122. 严芳, 章跃陵, 罗活强, 等. 凡纳滨对虾血蓝蛋白酚氧化酶活性的研究[J]. 水产科学, 2008, 27(1): 5-8. YAN F, ZANG Y L, LUO H Q, et al. The phenoloxidase activity of hemocyanin from white leg shrimp Litopenaeus vannamei[J]. Fisheries Science, 2008, 27(1): 5-8. 李义, 陈星, 李红霞, 等. 乐果对日本沼虾血淋巴溶菌酶与酚氧化酶活力的影响[J]. 水利渔业, 2005, 25(6): 87-88. LI Y, CHEN X, LI H X, et al. Effects of rogor on the activities of lysozyme and oxidase in Macrobrachium nipponense[J]. Reservoir Fisheries, 2005, 25(6): 87-88. Abstract: Litopenaeus vannamei was used as main experiment object. Chronic enrichment was used to determine the effect of copper in different concentrations or dissolved forms during 56 days on immune active substances in Litopenaeus vannamei. The experiments were divided into five groups:one control group without Cu addition, two groups of different dosage of complexing Cu group and Cu addition group with which matched the complex Cu group released Cu. The LC6911 type corrosion-resistant alloy Cu was used as a complex Cu source, using 0.15 m2 copper plate/m3 and 0.3 m2 copper plate/m3 respectively, and the other two groups added matched amount CuSO4·5H2O as Cu2+ source. The following conclusions were drawn:(1) In the water of non-cultured, the experiments used LC6911 type corrosion-resistant alloy Cu tiled with 2 m3 aquarium barrel bottom. The total Cu released by copper plate was directly proportional to those area. (2) Immune proteins CP, POX, MT activities improved under two concentration gradients in experimental group, which was significantly higher than control group (P < 0.05). 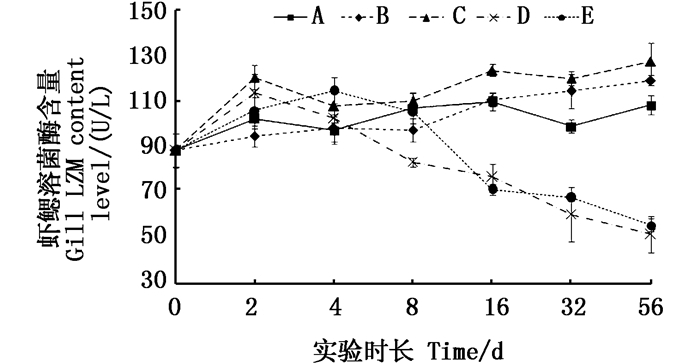 (3) The enzyme activity of LZM in shrimp hemolymph was found in the experimental group of two different dissolved states. The results showed significant differences among control group and others at the end of the experiment (P < 0.05). There was no significant difference between the two types of dissolved Cu and the different additive levels. And there was no significant difference in the LZM activity between the experimental group and the control group in gill tissue either (P>0.05). But the activity of LZM in Cu2+ group decreased significantly (P < 0.05). (4)The long-term growth data showed that the growth effect of the experimental groups was not significantly better than that of control group, and the growth effect of the 0.15 m2Cu-plate/M3 group was the best. The enhancement of the immune activity and growth of Litopenaeus vannamei by complexing Cu in water is more prominent than Cu2+, meanwhile, using 0.3 m2 copper plate/m3 in seawater has lower long-term toxicity effects on Litopenaeus vannamei's immune system.